From 65 to 115 € the night I book ! There's a get-away-from-it-all feeling at Le Relais de Tamaroque, an old coaching inn. 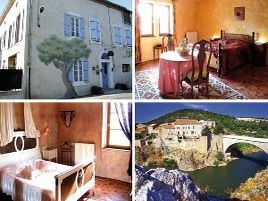 It overlooks the Berre valley and enjoys fantastic views of the Corbières. Both the Relais and the banks of the Berre are listed areas, thus preserving the authenticity and majesty of the setting.Suspended gardens and terraces. The building, rebuilt and changed over the centuries is very spacious. Every room enjoys exceptional views of the river and valley, all exuding rustic charm and conviviality. A hearty breakfast is served each morning with homemade jams and pastries. A warm and attentive welcome..
- dégustation des vins de Haute-Corbières : Domaine de Dernacueillette. - pêche dans la Berre sur place. 2 rooms with shower and WC. 65 euros (1 pers. ), 80 euros (2 pers. ), 100 euros (3 pers. ), 115 euros (4 pers.). Extra bed 15 euros. Baby equipment, babysitting possible, board games. Family suites. sortie n°39 (Sigean), prendre à gauche. Après le pont de la Berre, maison sur la gauche. The closest station is Narbonne, located at 15 km. The closest airport is Perpignan, to 45 km.